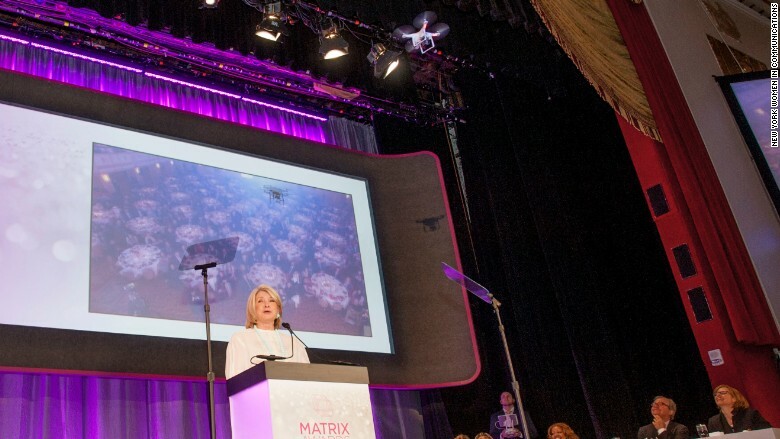 Martha Stewart introduced her drone onstage at the Matrix Awards event. "Bring your favorite tech toy" seemed to be the unofficial theme at the 2015 Matrix Awards. "Meet my drone," said Martha Stewart, as she opened the New York Women in Communications luncheon at the Waldorf Astoria in New York City. The Matrix Awards honor female leaders in government, publishing, business and entertainment. Nineteen years ago, Stewart herself was a recipient of a Matrix Award. Monday, she was emcee. Stewart has already professed her affinity for 3-D printers, but turns out, she's a fan of other cutting-edge technologies as well. Stewart said she typically uses the DJI Phantom drone to capture aerial photos of her farm in Bedford Hills, N.Y.
"Sometimes it sneaks over the line to Ralph Lauren's yard, but don't tell Ralph Lauren," she said. By using the device to take real-time aerial photographs of the luncheon, she wanted to show attendees "just how impressive technology is in the right hands." Stewart's use of the drone won approval from United States Chief Technology Officer Megan Smith, one of six recipients of a Matrix Award. "Alright Martha, I love the drone," said Smith as she took the stage. Smith brought up her own tech devices for a little show-and-tell. "This is a Raspberry Pi and this is an Arduino," said Smith, who previously worked as vice president of Google X. If those names don't sound familiar, they're small but powerful circuit boards inside cellphones. To Smith, they represent hope and the future of technology. "If kids could come to play with and love and understand the depth of this stuff, then they can be a part of the whole technical conversation," said Smith, who is mom to two sons ages 10 and 12. Smith underscored how important it was to normalize technology and remove the stigma associated with STEM fields. "What we show in media, it matters so much," she said. She praised ABC's Scandal for elevating women and minorities to powerful positions. Smith was hired by President Obama after the disastrous rollout of HealthCare.gov. Since then, she's played an integral role in efforts like TechHire, an initiative to help Americans get trained for tech jobs. Smith was honored alongside five other women: Debra L. Lee, chairman and CEO of BET Networks; Andrea Mitchell, journalist at NBC and MSNBC, Robbie Myers, editor-in-chief of Elle Magazine; Martine Reardon, chief marketing officer at Macy's; and Kristen Gillibrand, senator of New York. MIT Media Lab cofounder Nicolas Negroponte presented Smith her award. "I got to work with Nicolas and others on the beginning of the Internet. [Today] is really the beginning of digital government," she said. "I believe in the Jetsons' future. Getting from here to there will be full of innovation, brilliance -- but also a lot of complex policy."